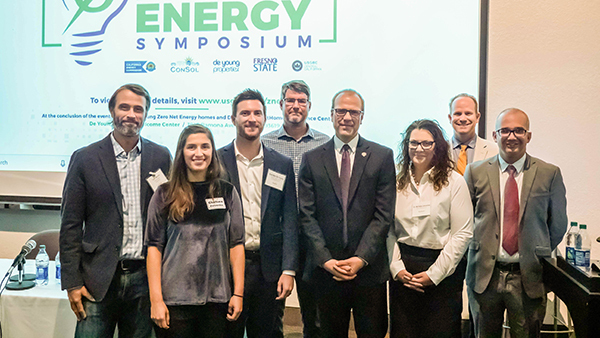 The future of homebuilding and its alignment with California’s advanced energy goals took center stage at A Path to Zero Net Energy Symposium held on campus Nov. 15. Led and moderated by Fresno State faculty representing three linked disciplines to Zero Net Energy (ZNE) with a keynote address delivered by Commissioner Andrew McAllister of the California Energy Commission (CEC), the symposium engaged students from related fields, homebuilders, real estate agents, urban planners and government officials alike on everything from ZNE building science technology, policy updates and ZNE market value to decarbonization in California and advancements to California’s electrical grid. For a home to be considered ZNE, it must be exceptionally energy efficient and designed with the potential to produce – through renewable energy sources – as much clean energy as it consumes in a year. The symposium featured a keynote address by McAllister and an expert panel comprised of Robert Raymer, senior engineer/technical director, California Building Industry Association; Garth Torvestad, senior technical consultant, ConSol; Brandon De Young, executive vice president, De Young Properties; and Tom Harvey, senior manager, Tesla Energy. The panel discussion was moderated by Fresno State faculty; Dr. Michelle Calvarese, professor and department chair, Department of Geography and City & Regional Planning, College of Social Sciences; Brad Hyatt, P.E., LEED AP, associate professor and department chair, Department of Construction Management, Lyles College of Engineering; and Dr. Andres Jauregui, associate professor and director, Gazarian Real Estate Center, Craig School of Business. Visit the Lyles College of Engineering blog to read more.